Heat a saucepan over medium-high heat. Add cumin and mustard seeds, swirling pan to mix. Cook for 3 to 5 minutes or until cumin seeds are toasted and mustard seeds start to pop. Reduce heat to medium. Add oil, onion, garlic, ginger, chile and garam masala. Cook, stirring, for 3 to 5 minutes or until vegetables start to soften. Add water, lentils, turmeric, bay leaves, brown sugar, salt and pepper. Bring to a boil. Add cauliflower and sweet potatoes. Reduce heat to low and simmer. 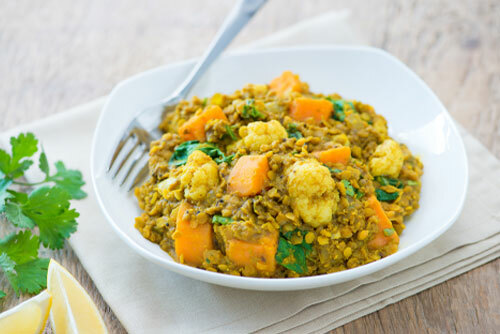 Cook, stirring occasionally, for 20 to 25 minutes or until lentils, sweet potatoes and cauliflower are tender. Stir in spinach. Cook for 30 to 60 seconds or until wilted. Remove from heat. Remove bay leaves. Stir in lemon juice and cilantro. Red lentils are quick cooking and require no soaking before use. For some extra protein, try adding leftover LiberTerre Chicken that has been cubed or shredded. Make a large batch at the beginning of the week and take this protein-packed meal for lunch. If kept in a tightly sealed storage container, cooked lentils will keep in the fridge for up to 5 days.